100mg/ml. 5ml vial or 50ml vial (on mfg backorder). For Intramuscular Use In Horses Only. Not for Intra-Articular Use. Why Adequan i.m. for horses? It's the ideal, complete treatment for non-infectious degenerative joint disease. For full prescribing information consult your veterinarian and product insert. Each 5 milliliters of Adequan® i.m. contains 500 mg of Polysulfated Glycosaminoglycan and Water for Injection q.s. Sodium Hydroxide and/or Hydrochloric Acid added when necessary to adjust pH. Sodium Chloride may be added to adjust tonicity. Polysulfated glycosaminoglycan is a naturally-occurring complex molecule that is the essential building block of the cartilage matrix. Adequan travels into injured joints and stimulates production of new cartilage while relieving the symptoms of non-infectious degenerative joint disease. The recommended dose of Adequan i.m. in horses is 500 mg every 4 days for 28 days intramuscularly. The injection site must be thoroughly cleansed prior to injection. Do not mix Adequan i.m. with other drugs or solvents. Adequan® i.m. (polysulfated glycosaminoglycan) is the only FDA-approved treatment proven to relieve symptoms of non-infectious degenerative osteoarthritis, to stimulate cartilage repair and reverse the joint disease process. There is no generic version of Adequan® i.m. Studies have not been conducted to establish safety in breeding horses. WARNING: Do not use in horses intended for human consumption. Not for use in humans. Keep this and all medications out of the reach of children. Caution: Federal law restricts this drug to use by or on the order of a licensed veterinarian. 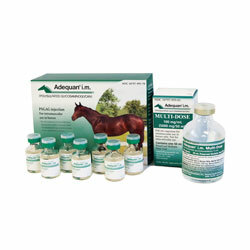 See product package insert for full prescribing information by visiting www.adequan.com. ©2014 Luitpold Animal Health. Luitpold Animal Health (logo) is a trademark and Adequan® is a registered trademark of Luitpold Pharmaceuticals, Inc.